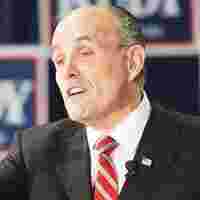 Economically appealing: Rudolf Giuliani strongly supports free trade, whether by multilateral or bilateral treaties. Rudolf Giuliani’s record and his proposed policies suggest tight spending controls, fiscal discipline and maybe reduced taxes. His health care and education plans to emphasize increasing market forces in those bureaucrat-dominated areas are also economically appealing. The worries are his temperament and his foreign policy views, which together risk leading him into economically destructive international entanglements. The former New York mayor’s tax policies are modest but sensible. In particular, he is correctly worried about the US savings rate, and favours policies to increase it. He opposes expensive “cap-and-trade" systems of carbon emissions control, preferring to tackle the problems of energy security and global warming by expanding nuclear power station construction and removing restrictions against energy production from domestic sources such as Alaska’s North Slope. Giuliani wants to cut earmarks and develop a constitutional line-item veto. He would gradually reduce agriculture subsidies, but disappointingly has supported ethanol subsidies even though nobody expects him to win Iowa. He strongly favours free trade, whether by multilateral or bilateral treaties. All this is very fiscally sound. So, too, is his health care policy, where he wants to eliminate state laws preventing insurance policies from being sold across state lines—probably helpful in restraining costs. On education, he favours reducing Federal mandates and working towards true parental choice, by means of vouchers or otherwise. Giuliani’s record as mayor of New York was in general very creditable, with a sharp reduction in crime, a booming economy and controlled public spending. The worry is foreign policy. Giuliani has surrounded himself with neo-conservatives, now out of fashion in Washington for their counsel on the occupation of Iraq. Together with the former prosecutor’s own natural belligerence, that suggests he may follow an economically dangerous aggressive foreign and security policy, particularly in West Asia. His best-known adviser Norman Podhoretz’s new book,World War IV: The Long Struggle Against Islamofascism, sets out the Neocon goals, including the use of military force against Iran—but even its title suggests that if implemented, its recommendations would prove ruinously expensive. These shades of Manichean struggle between good and evil cast a pall over Giuliani’s strong leadership, sound fiscal policies and capable management.